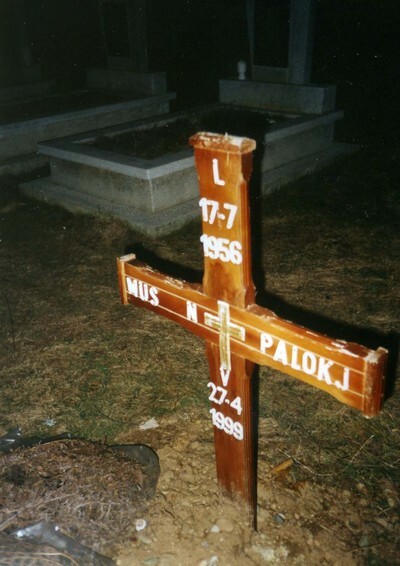 A Catholic grave marker at Korenica, Kosova, 1999 -- Photograph by Stephen Schwartz. In the name of the Center for Islamic Pluralism, an international network of traditional and moderate Muslims, including scholars, academics, journalists, authors, clerics, and Sufi shaykhs, with active groups and correspondents in nearly 30 countries, I appeal to adherents of all faiths for memorial prayers to honor the dead in the massacres of Bosnian Muslims at Srebrenica in 1995, of Albanian Catholics slain at Korenica in Kosova in 1998, and the victims of other such atrocities in Slovenia, Croatia, Bosnia-Hercegovina, Montenegro, Serbia, and Kosova during the Yugoslav Wars of 1991-99. The 16th anniversary of the Serbian capture of Srebrenica came on July 11, 2011. Acts of mass murder that took some 8,000 Bosnian Muslim lives were committed from that day in 1995 until at least July 22, 1995. Commemoration of the deaths at Srebrenica arrives, this year, after the long-overdue arrest of Ratko Mladić, the Serbian terrorist chief who, under color of military responsibility, directed many of the worst violations of human rights and outrages against human dignity during the fighting in Croatia and Bosnia-Hercegovina. Mladić was protected by the Serbian political and military apparatus for 16 years after the end of the Bosnian war in 1995. Srebrenica had been designated a "safe area" by the United Nations and was under the "protection" of the Netherlands armed forces (Dutch Battalion or DutchBat) in 1995. Yet Dutch troops enabled the Serbs in their satanic work, assisting the invaders in separating out men and boys, loading women and children on buses for their removal, and otherwise sharing complicity in the horror enacted there. Srebrenica remains inside Serb-held territory today. It is therefore a symbol not only of the cruelty of the Bosnian war, but of the injustices perpetuated by the so-called "international community." In a wider sense, numerous prior errors of the democratic West and of international "peace-keeping" institutions made the tragedy of Srebrenica inevitable. A "chain of failure" began in 1991 when the U.S. and Western Europe declined to act against aggression in Slovenia by Slobodan Milošević and his Belgrade clique. Communism was ending and Yugoslavia could have provided an example of decentralization and economic reform, leading the way for the rest of the Eastern Bloc. Serbian complaints that their sovereignty was undermined by "secessionists" was proven to be hollow rhetoric, given that the Baltic states had gained independence from Moscow, Belgrade allowed Macedonia to leave Yugoslavia peacefully, and the Czech Republic and Slovakia later separated without conflict. This dereliction by the democratic nations regarding the attack on Slovenia was repeated in the imposition on Croatia and Bosnia-Hercegovina of an "arms embargo" that benefited the Serb aggressors; in the establishment of the "Dayton accords" that rendered the criminal partition of Bosnia permanent; in the lassitude of the so-called "international community" in pursuing the main Serbian plotters; and in the current maintenance of Bosnia-Hercegovina and Kosova in a state of legal dependency, by which local authority is usurped by entities like the so-called Organization for Security and Cooperation in Europe (OSCE). It has been forgotten that the OSCE was established by the "Helsinki Final Act" of 1975, with the participation of four undemocratic states that no longer exist: the former Soviet Union, the former Czechoslovak Socialist Republic, the former German Democratic Republic (East Germany), and the former Yugoslavia. These four dictatorships have been consigned to the past, but the OSCE, in the creation of which they were crucial, continues to rule the lives of Bosnians and Kosovars. The bankrupt legacies of the ex-Communist states, as well as the policy missteps of the "international community," are liable to persist in Bosnia-Hercegovina and Kosova, even if all the dead of Srebrenica are buried properly and evil-doers like Mladić are tried and convicted. Bosnia-Hercegovina will likely stay partitioned; Kosova may still be denied full sovereignty; meanwhile, it appears unavoidable that Serbia will be forgiven and welcomed into the company of respectable nations. Serbian compensation for the death and destruction wrought by its armies and irregulars is never discussed. We run the risk, unfortunately, of treating the anniversary of Srebrenica in a perfunctory manner. The mass bloodshed at Srebrenica has become symbolic of the overall campaign to create a "Greater Serbia" in place of a moribund Yugoslavia. But the martyrdom of Srebrenica was not unique. Remembering Srebrenica should not be a pretext for ignoring the rest of the crimes coldly planned in furtherance of the scheme for a "Greater Serbia," and the continuing consequences of Western and democratic passivity toward them. Before Srebrenica, Serbian troops and irregulars committed similarly heinous acts at Vukovar and elsewhere in Croatia, throughout the Drina River Valley and in north and west Bosnia, and in eastern Hercegovina. The second largest mass homicide of Bosnian Muslims occurred at Prijedor in northern Bosnia; the Prijedor region was also the site of the concentration camps of Keraterm, Trnopolje, and Omarska. But such considerations leave out the gruesome effects of the sustained shelling and sniping at Sarajevo. I recalled the deaths at Sanski Most, in the vicinity of Prijedor, as follows, in a text published after the war by the heroic Sarajevo daily Oslobođenje and included in my book Sarajevo Rose: "When Sanski Most was seized by Serb extremists in 1992, and the Muslim population was 'cleansed,' many of them to be executed immediately, the gentle, funny poet [my friend, Amir Talić] had become the head of the clandestine resistance and aid group Merhamet. Of course, he was eventually arrested. But his wife and children refused to leave the city in which they had lived their whole lives. Then news came that they could visit him in prison, but Amir's wife could not make the trip. His handsome son Ammar took it upon himself to go to Banja Luka, the main Bosnian city controlled by Serbs. "What can we say of children saved from death by the accident of where they sit on a bus, as it wends its way through enemy territory? I know the silence that attends the passage along such landscapes; but that is all I know." I also know, however, and cannot forget, that on July 19, 1998 the first serious battle between Serb forces and the Kosova Liberation Army (KLA or UÇK) took place in the town of Rahovec. A picturesque location surrounded by vineyards, Rahovec features a lower and upper town. Open fighting in the streets of the lower town culminated in a Serb assault on the Khalwati-Karabashi Sufi installation in the upper town, known as the Sheh Myhedini teqe, in which hundreds of terrified residents had gathered. There, rahmetli sheh Myhedin Shehu, radiallahuta'ala – qaddas sirrahu'l aziz, was killed, along with the people he had given shelter. In the teqe at Rahovec, up to 150 Albanians died; the Serbs buried the victims in two mass graves in the area of Prizren. The sons of sheh Myhedin – sheh Besim Shehu, sheh Hilmi Shehu, and sheh Jahja Shehu – carry on his work. "I first learned of the crime of Korenica only months after it took place, during a visit to Gjakova. I found out about the killings accidentally, when I drove along a rural road and found a Sufi tyrbe or mausoleum. Inside the structure, I was shocked to discover the coffins of 24 infants. It was then that I learned about the Korenica slayings, and was taken to a graveyard that included many wooden markers with the initials 'N.N.' for an unidentified corpse." Similar horrors are enacted in Libya and Syria, and again, now, the Western, democratic nations, which should lead the global effort for defense of humanity, appear stricken by timidity, if not indifference, in the face of depravity. In recalling Srebrenica and the other terrible moments of the Yugoslav Wars, recitations of Fatiha and readings of Surah Ya Sin are appropriate for Muslims. But let us as Muslims, joined by our Christian and Jewish friends and neighbors, advocate and work for an end to all oppression everywhere. As Musa aleyhisalem [Moses] said to the Creator, in words recorded in Qur'an 28:17, "Oh my Lord, because you have favored me, I swear I will never serve transgressors."